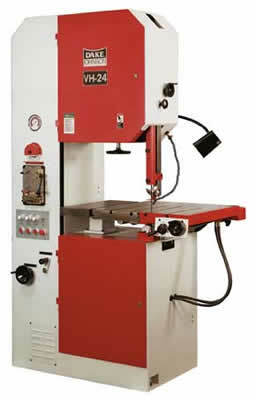 Heavy duty vertical band saws with plenty of power and room for work pieces. The models within this family of vertical band saws have throat sizes from 16 to 41 inches. Features an adjustable pressure for the blade – up to 60 lbs. of pressure. 50-500 variable continuous speed range. V-40 & VH-40: 41″ saw for larger work requirements. Auxiliary worktable measuring 15-1/2 x 21-1/2″.